The classic character of Xiaolongnu in the Hong Kong 80s TV series The Return of the Condor Heroes was made for Idy Chan. Her portrayal of this role made her a household name throughout Asia. Despite the cold exterior of the character, she was classy, elegant and feisty and played to perfection by Idy and the critics just loved her. 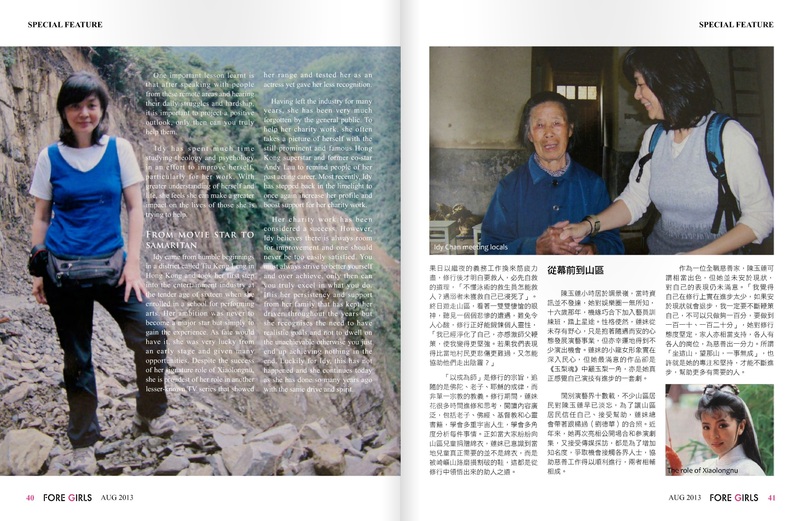 While Idy Chan is no longer in the showbiz limelight, she has still been very active diverting her energy into charitable causes in remote regions of China, trying to help others less fortunate in the spirit of humanity. When asked why she became a volunteer worker, she was quick to point out that, actually, she as an organizer rather than a volunteer. A volunteer is someone who joins an organization to help others where as she organizes and manages charity projects allowing her to personally choose the direction in which to help others. She believed that helping others was an important cause and one should do so with conviction rather just for the sake of it. In 2008, while organizing a charity event, friends suggested her that she should set up schools in these remote regions to provide that local children with access to education. What seemed like a logical step was not the appropriate one as she witnessed many schools had been built by others but the demand was not there, simply because there were not enough children to fill the schools. So, now with the benefit of hindsight, Idy will assess the needs of the region to establish what will really make a difference to their lives. Idy has managed to successfully continue doing charity work by benefiting from the people she surrounds herself with, people who can see potential in and hence will support and sponsor them so that they can fulfill their potential. Under the tutelage of her mentor, she explains, she has changed a great deal and her experience in this field of work has led her to respect those who do this for living even more. She recognized this work to be both mentally and physically tiring and in order to help others, you first help yourself. 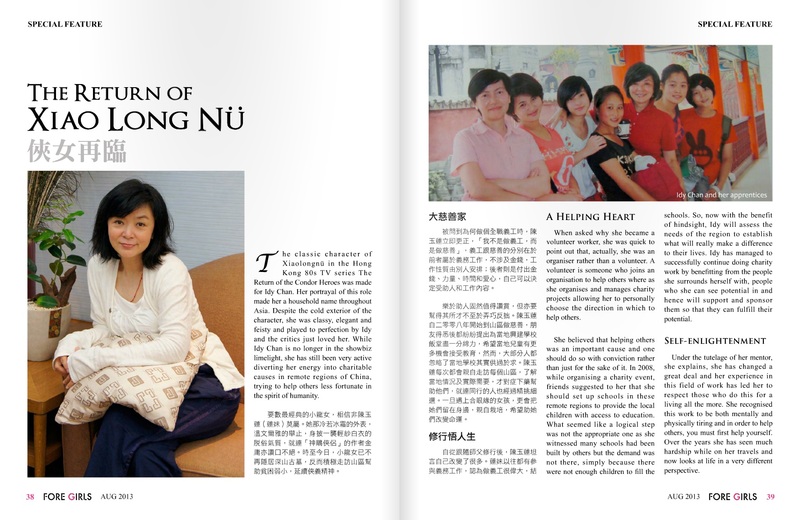 Over the years she has seen much hardship while on her travels and now looks at life in a very different perspective. One important lesson learnt is that after speaking with people from these remote areas and hearing their daily struggles and hardship, it is important to project a positive outlook, only then you can truly help them. Idy has spent much time studying theology and psychology in an effort to improve herself, particularly for her work. With greater understanding of herself and life, she feels she can make a greater impact on the lives of those she is trying to help. Idy came from humble beginnings in a district called Tiu Leng Keng in Hong Kong and took her first step into the entertainment industry at the tender age of sixteen when she enrolled in a school for performing arts. Her ambition was never to become a major star but simply to gain experience. As fate would have it, she was very lucky from an early stage and given many opportunities. Despite the success of her signature role of Xiaolongnu, she is proudest of her role in another lesser-known TV series that showed her range and tested her as an actress yet gave her less recognition. Having let the industry for many years, she has been very much forgotten by the general public. To help her charity work, she often takes a picture of herself with the still prominent and famous Hong Kong superstar and former co-star Andy Lau to remind people of her past acting career. Most recently, Idy has stepped back in the limelight to once again increase her profile and boost support for her charity work. Her charity work has been considered a success. However, Idy believes there is always room for improvement and one should never be too easily satisfied. You must always strive to better yourself and over achieve, only then can you truly excel in what you do. It is her persistence and support from her family that has kept her driven throughout the years but she recognizes the need to have realistic goals and not to dwell on the unachievable, otherwise you just end up achieving nothing in the end. Luckily for Idy, this has not happened and she continues today as she has done so many years ago with the same drive and spirit. She is STILL and always beautiful in my heart. Her heart is wider than the ocean and her desire to help people is taller than Everest Mountain…I admire her more and more every day. I think I am CRAZY about her because every day I have to think about her character of Lan Linh princess at least 4-7 times per day. Does it sound weird and insane? Hope not!